My Fabulous Class: Crafty Sunday...with some FREEBIES! Oh, my, where does the time go???? I was on a blogging roll and then.....crickets! LOL. What can I say? Soccer season has begun! Today, I found some time to get crafty! I went to my favorite store...Dollar Tree and found these goodies. How much do you LOVE these erasers???? The little earths will go perfect with my Earth Day Sums of 10 freebie. Just so you know, there are 9 earths, buses, apples, and check marks, but only 3 rainbow stars - and I bought them for the rainbow stars. The plastic letters are not magnets, but I did not buy them for that. I also bought spray paint at Michaels in silver and gold. I was feeling inspired by this pin. 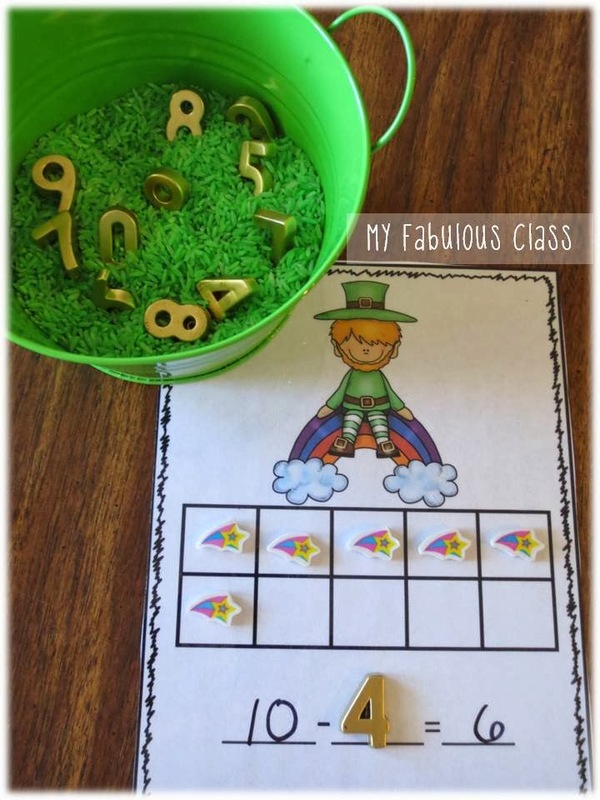 You can get this pot of gold free by going to PreK-Pages. Aid and oil before. It did NOT work. Rubbing Alcohol worked SO MUCH BETTER! 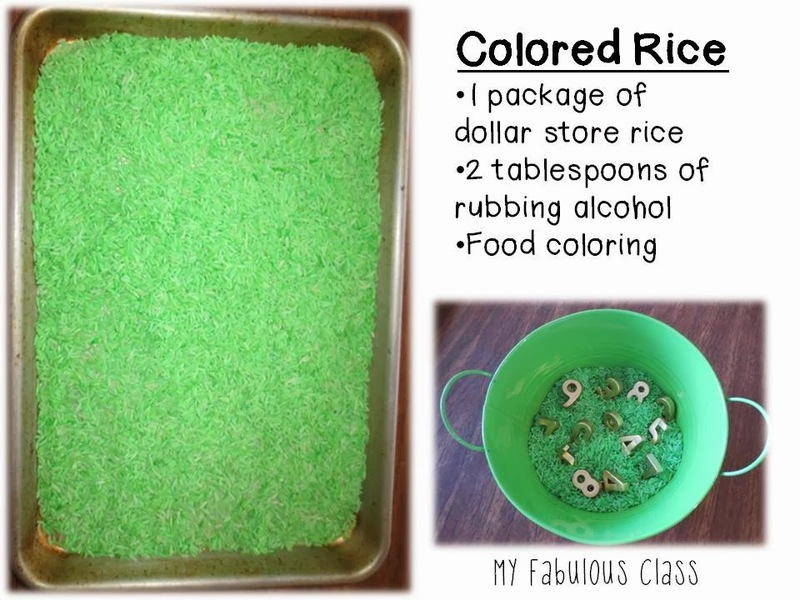 I spray painted the letters and numbers gold and put them in the green rice. I also spray painted some beans gold and silver. 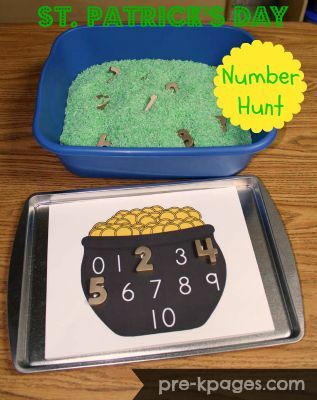 Students can take a number out of the rice bucket and add that many gold beans. Then, they can see how many more silver beans they need to make 10. In this picture, you can see the adorable star rainbows. 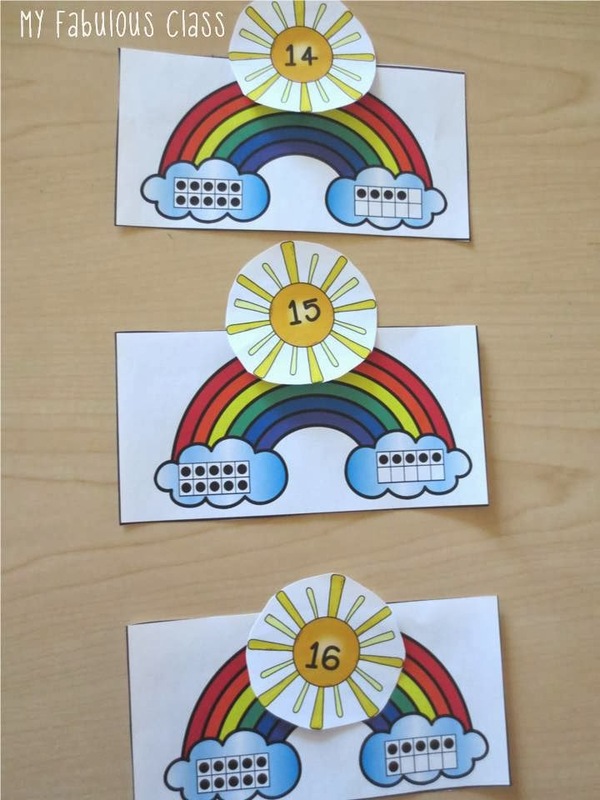 Students start with 10 rainbows on their ten frame. They pull a number from the bucket and remove that many rainbows. Then, they can record their answer. Just remember, there are ONLY 3 rainbow stars in each package. I know I am going to have to go back tomorrow. 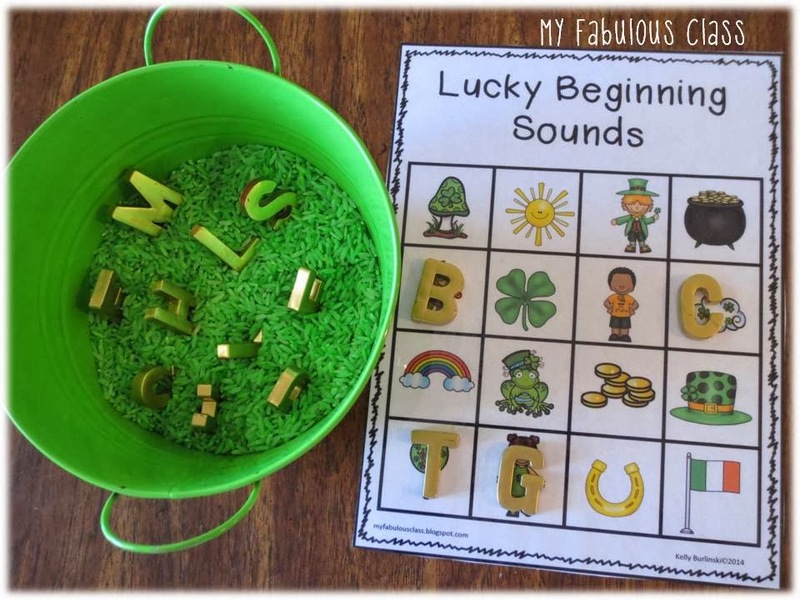 For the letters, I created this Lucky Beginning Sounds sheet. Students pull out a letter and decide which picture starts with that letter. There are 4 different sheets, so students can play against each other to get 4 in a row. Do you LOVE these???? Well, you can get both ten frames AND the Lucky Beginning Sounds FREE HERE. 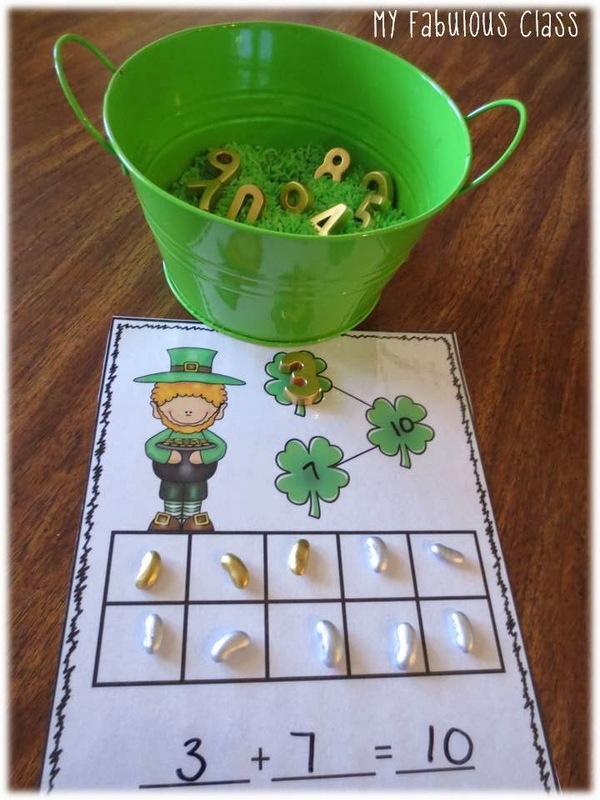 I FINALLY posted my St. Patrick's Day Math Centers. There are 11 Math Centers in all. Here are a few pictures that I took on Friday when I started to introduce them. I LOVE dominoes and yet this is the FIRST time I have used them this year!!!! The kids LOVED them. There are 4 different domino cards. 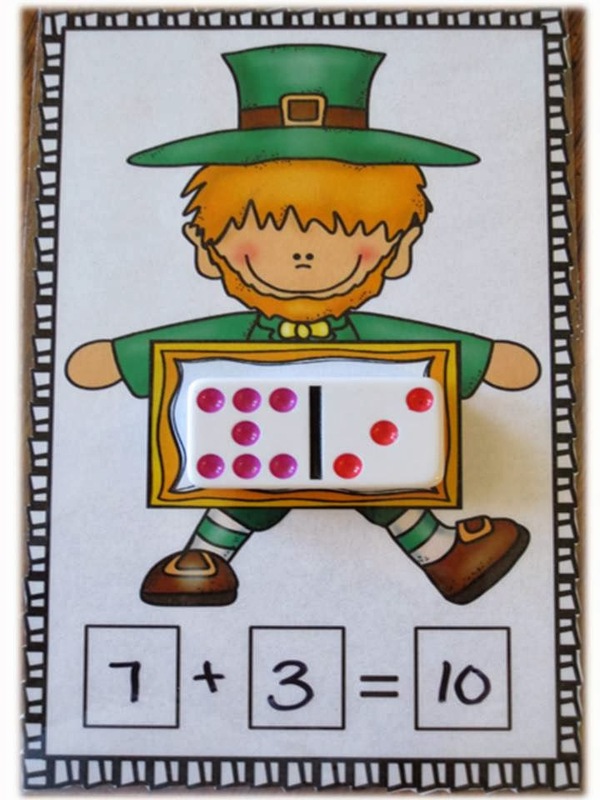 There is one for just writing the number, one for adding the numbers, one for subtracting, and this one, where students can add and subtract. 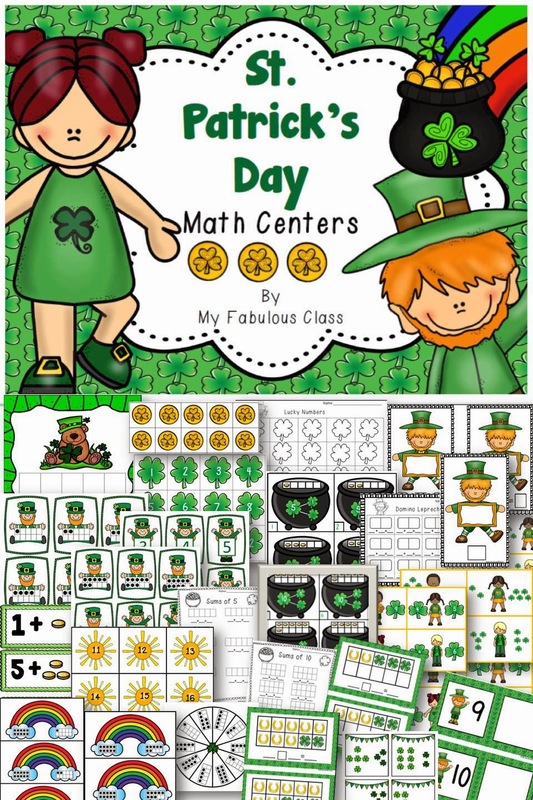 You can get all 11 Math Centers sale for 50% off for the next 48 hours. Ok.....if you really want them, leave a comment, with YOUR EMAIL, and I will pick one person to win this FREE. So fun!!! I love the math centers :) That was an amazing idea to spray paint the numbers. So easy, yet so genius! This is so cute! I hope to have the letters spray painted by the weekend to use your freebie with my class next week. Thank you so much for that treat! Hope the luck of the Irish is on my side when you choose! These are wonderful!!!! I love your ideas. ahorne@btes.tv Keeping my fingers crossed!!! 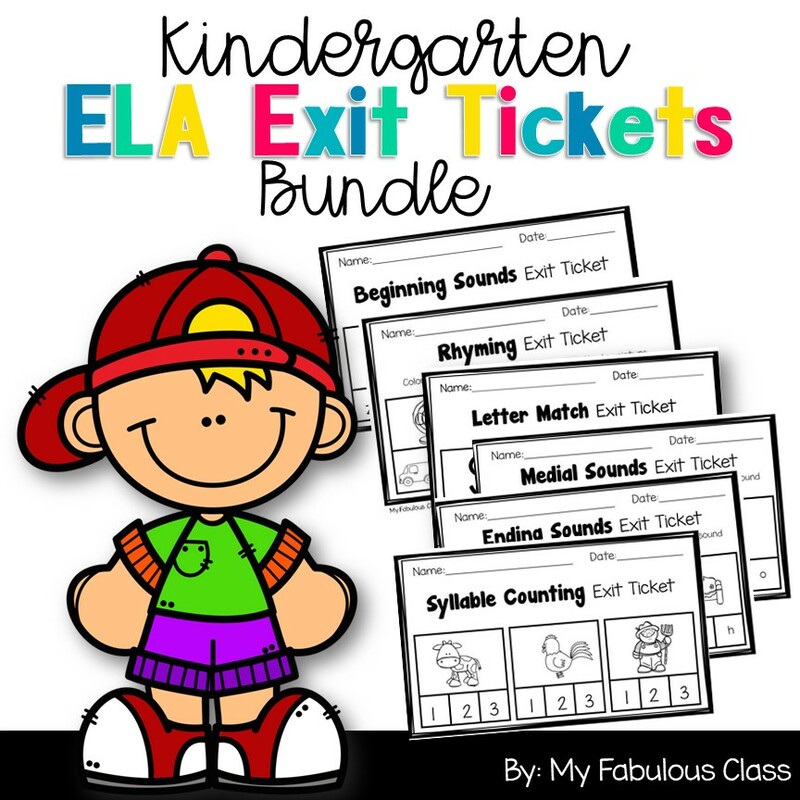 These are such great resources!! I absolutely LOVE these! Hope I get to use them with my students before I go out on maternity leave. Click on the FREE HERE button to get the freebies. Super simple, wonderful, and inexpensive ideas! 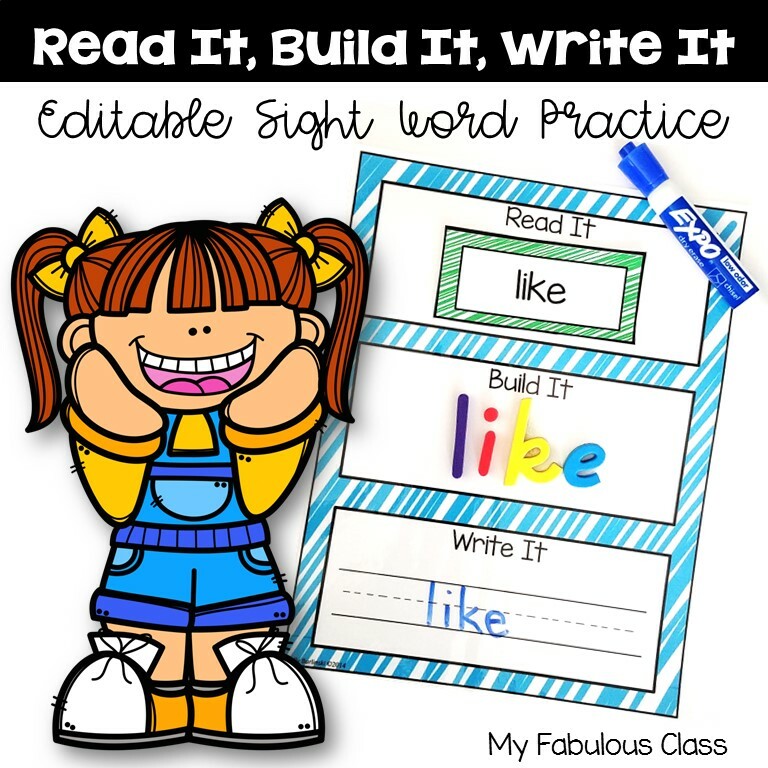 This is a packet that I would love to do with my Kindergarten students. 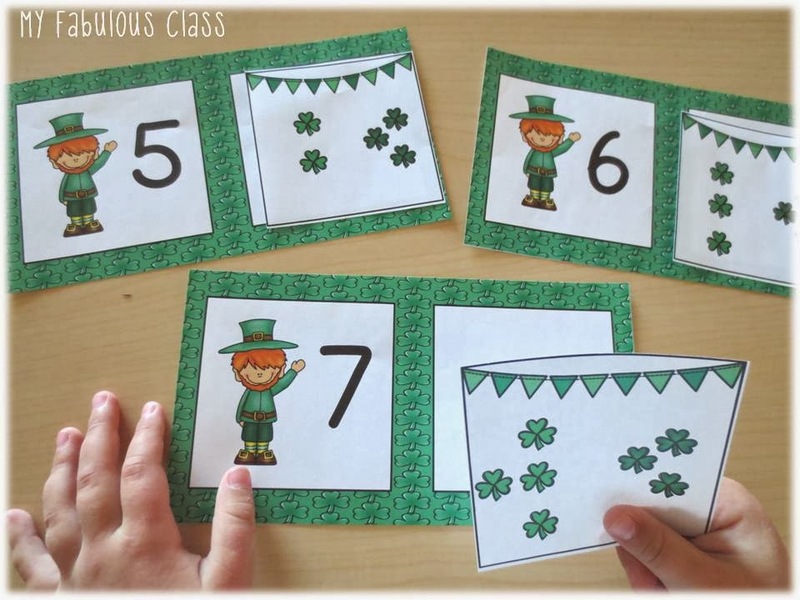 I have some students who are low and this would be a great activity for them to practice learning their numbers. Wow this is awesome. 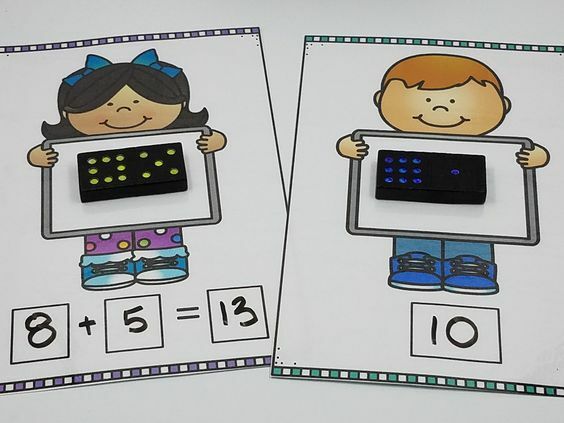 Not only could I use these in my classroom I could also use these at home with my son who has autism. 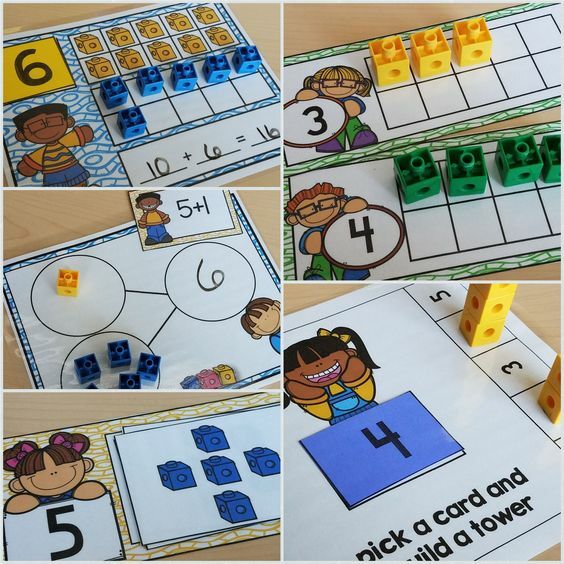 The visual and hands on learning would be great for all! 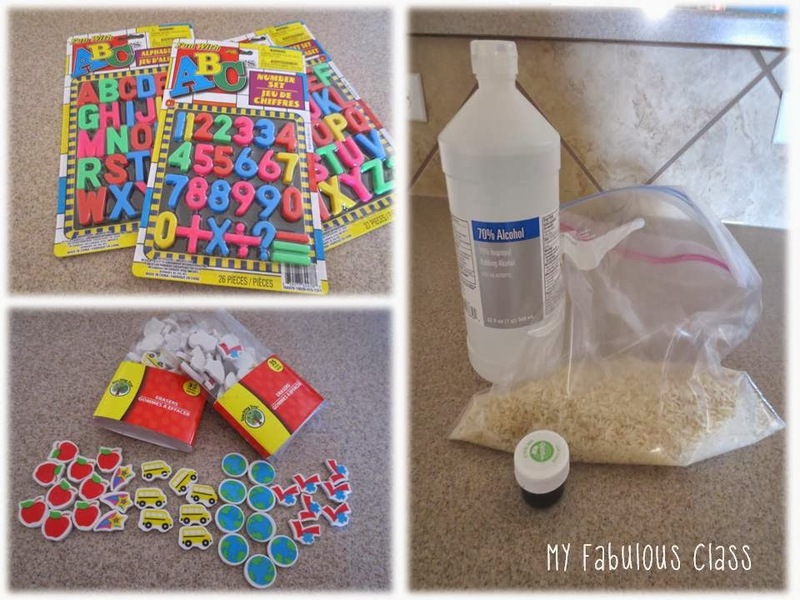 I teach in a prep-K class and I know all of my kids would enjoy these activities.